← Rupert Murdoch ‘must be held responsible’ for Rupert Murdoch world says. After days of terror where gangs of cats peed in neighbour’s gardens and bailed up dogs while the cats owners chanted ‘cats are great!’, moderate cat ladies have been urged to condemn extremist cat ladies. The attacks seemed to be in retaliation to an unflattering depiction of a cat in the latest issue of the Harold Kennel Club’s monthly magazine, but most villagers say a poorly drawn cat by a dog owner can never be an excuse for a feline rampage. Harold Mayor Rufus D Jackson appealed for calm saying that while the actions of extremist cat ladies were abhorrent and should be condemned, cat ownership itself is a peaceful pastime, and society will be stronger if cat owners and dog owners stand united against extremism in all its forms. Mayor Jackson pointed out that Sally Evans, the hero of the siege at 44 Blumley Way, was herself a cat owner, and her quick thinking in luring 28 cats away with a bag of Purina One (turkey flavour) saved three nervous Labradors substantial further humiliation. The Mayor’s speech was politely received, but opinion in the village remains polarised. 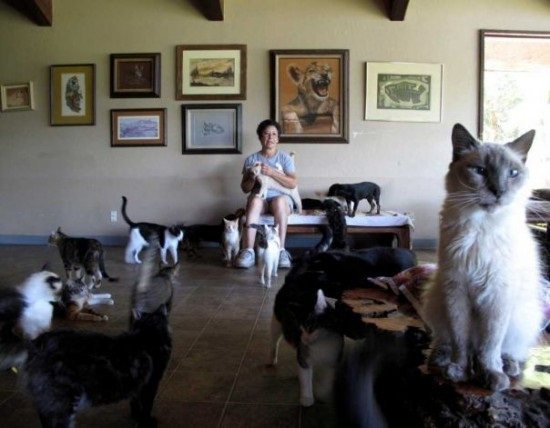 “I don’t know – is there really such a thing as a moderate cat lady?” said Councillor Ron Ronsson, who changed his Facebook picture to ‘I am a dog’. Harold Independence Party Leader Lionel Garage blamed ‘bloody immigrants’. When it was pointed out that both the cat ladies behind the attacks were English, and all their cats were similarly home-grown he responded ‘bloody immigrants’. Emilie Bourdain, who runs a wildlife sanctuary on the outskirts of Harold, said the issue was complicated.